Lease negotiations, sales, property rights, zoning analysis, title reviews and closings. 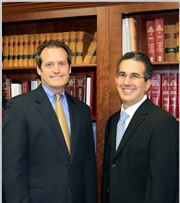 The Attorneys at Goldberg & Wolf have served clients in Southern New Jersey and Philadelphia since 1992. By drawing from our diverse backgrounds and local roots, we were able to create a unique mission that would ultimately become the blueprint for our law firm. At the core of our mission is our desire to provide creative and cost-effective solutions to our clients’ legal matters. For more information about any of our services or to schedule a free consultation, please give us a call or e-mail us. We provide review of commercial and residential contracts, and conduct lease negotiations, sales, purchases, property rights, zoning analysis, title reviews and closings. All areas of your company's legal needs including corporate formation, shareholder agreements and collections.